support your local comic book! i have this dear friend, diane. she lives just outside of philadelphia and is a licensed hypnotherapist and life coach. and a really wonderful person! her intuition, insight, and remarkable compassion make her, not only good at her job, but a great friend as well. she's a lot like our joann in the perhapanauts too; part den mother, part calming force, seeing the inner beauty in everybody. now i've had this argument (or, let's call it a discussion) many times with people, that if there are ghosts and ufos and bigfoots and stuff all around, how come more people don't see them. and why, especially, aren't these spirits, entities, whatever, being seen by skeptics, more reliable witnesses, ie; pragmatists. my argument is that we--those of us who WANT to believe--are wired differently. we are open to the possibilities of there being more there than what we see. we don't dismiss things as fantasy simply 'cause we cannot touch or feel or verify them. a bump in the night is just the house settling to a scully. but it's a world of possibility to the mulder. so diane has lived in this house for years. she says that she has always felt the presence of others. a man and a woman. and a cat. she's seen the cat. many times. at the end of a hallway, out of the corner of her eye, shooting across the room. "My dog and I always hear someone walking up my stone driveway, only to look and find no one there. My daughter has seen the man in my driveway. My cousin asked to sit in another chair in my kitchen, because she could see someone walking out on my deck." "Someone tells my dog to sit and stay. She won't move and sometimes I have to say, release her, and walk up to her and tell her it's ok and to come." diane told me that, when she first moved in, she would often smell smoke and drive herself crazy walking all around the house trying to find it. at one point, her friend, linda, announced to the house to stop with the smoke because it was frightening diane. she hasn't smelled it since then. we've chatted a lot about this--as well as a ton of other things--but the subject came around to the ghosts again and she told me this. "My most frightening experience was when I was on vacation, my husband and I were staying in an old cabin and I was reading one night in bed. As I read, I felt someone get into bed with me. At first I thought it was my husband, but was confused because I was facing the door and he hadn't come in, and the other side of the bed was by the window. I jumped out of bed because I thought someone had gotten in from the window. There was no one in the room. and the window was locked." spooky. and it made my other friend, liz's, hair stand up on the back of her neck. so here's the thing. some people would say that diane is seeing things due to an overactive imagination. they would scoff and bluster and write it all off as nonsense. they would say that she makes herself see these things because she WANTS to believe. i think that's part true. i think she sees them 'cause she's open to it. part of it is her natural sensitivity, she is gifted with better eyes for this. she can sense their energy. pragmatists can't do this. they either don't have the tools or they do but just won't take the time to develop them. the other part is that diane is open to this. she makes herself open to it. yes, she wants--she wants to be open to every possibility. thanks for sharing your stories, diane! Spooky story. That was great. What's the story with the photos? 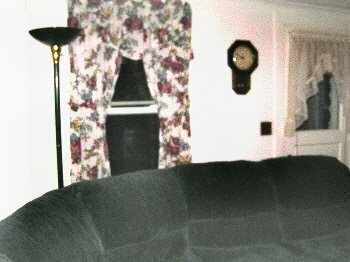 the photos are just window dressing--pics i picked up from a website that features "ghost photos". not related to diane's story at all. the first one is s'posed to be a girl's face looking--or reflected in--the window. 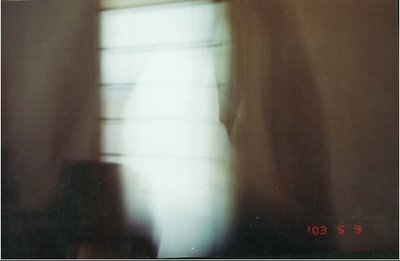 the second one, just a ghost. And here is was thinking, yeah, that does look like a cat in the window. Shows what I know. Something a little strange happend at work this past week. Not really a ghost story per se, but a little strange none the less. I had a settlement form that needed to be signed by two separate people in the office. In typing the information for the first person to sign, his name, phone number and the date, the type writer ran out of inked ribbon on the "6" for 2006 in the date so that it was only half printed. I got the form signed by the first person and then took it directly to the next person to sign stopping on the way to use a different type writer to type the second person's name, phone number and date. The second person signed in my presence and I then made a copy of the form, put a cover letter on it and sent the original off to the person who would process it for payment. Three days latter the original form reappeared in my in box and I thought it had somehow gotten incorrectly rerouted by the mailroom. However, on closer inspection I realized that the form was now different. The name, phone number and date under the second person's signature was no longer printed, but was handwritten in the same blue ink as the signature. I then thought, maybe the form got damaged in transit and someone else had recreated it. However, when I took out my copy of the original I had sent off to compare the two, the signature of the first person as well as the half printed '6" in the date were exactly the same. Now, I suppose its possible that someone whited out the second person's signature and information, made a copy so the white out would not show and then got the second person to again sign it, but I can't imaging why anyone would go through all that trouble as none of the financial information on the form was changed and even if they had, why drop it back in my inbox. Also, since the signature of the second person who signed the form in front of me had overlapped the typed information for the first person who had signed, it would be very difficult to completely white out that person's name without maring the typed information, and it was not marred. As I say, not a ghost story, but certainly something for which there is no ready explanation.